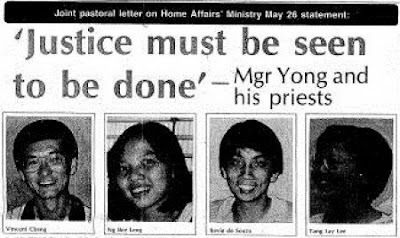 Singapore YCW fulltime worker, Tang Lay Lee, was among 22 Singaporeans arrested in May 1987 as part of an alleged “communist network”. Twenty five years, Edgar D’Souza, a former Catholic priest, recalls the events of that time in an interview with Elaine Fe of www.publichouse.sg. I was utterly shocked. I knew some of those detained personally, as they were workers in church ministries. Vincent Cheng had studied in the seminary with me and I knew him well. I could not believe he was anything but an ardent Christian who only wanted to follow the way of Jesus Christ. He cared for the poor and marginalised and wanted justice for all—especially for the voiceless and down trodden. At that time he worked with Fr Joseph Ho of the Justice and Peace Commission. Vincent was executive secretary. I knew lawyer Tang Lay Lee and her work with the Young Christian Workers group in Jurong with Fr Patrick Goh. And I knew Kevin de Souza (not related), who worked with students from Singapore Polytechnic. Through him I offered spiritual support (offered masses and gave talks particularly on the church’s social teachings) to a students’ group. All these people were working with the Catholic Church and following her teachings in the light of Vatican Council II, which saw the role of the church to realise Jesus’ views and teachings in a modern world.